Influencer marketing has proven to deliver results for all types of businesses – from global brands to smaller e-commerce businesses. One of the main reasons for this is because influencers know how to create authentic (e.g. highly engaging) content that helps brands cut through advertising noise and reach their target customers . They engage their followers effectively through unique and authentic voices. Influencers are also create excellent native content on social platforms where today’s customers spend a crazy amount of time. They are capable of telling brand stories in a creative and compelling manner. All of these capabilities may make influencers an effective advertising channel , but what doesn’t change is the fact that they are real people. This also means that they know the pains and motivators of everyday consumers. Their followers relate to them because of this, which makes it a lot easier for them to influence people’s purchase decisions., Influencer content feels native to the social channels being used by consumers. Because it is not intrusive influencer content is more likely to engage and motivate an audience. In spite of all the benefits, influencer marketing presents challenges that could affect impact your campaign efforts. The biggest problem is that it is difficult to measure. 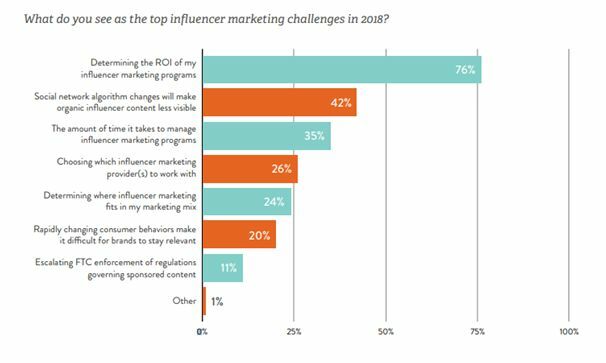 In fact, Linqia found that it is the top influencer marketing challenge for 76% of marketers in their survey. This isn’t a huge surprise since there are many factors that can make ROI measurement a challenge in influencer marketing. Traditionally, marketers need to rely on estimates and screenshots of results to understand the reach, engagement, and impressions of their influencer marketing campaigns. And it has been highly challenging to measure downstream events such as clicks and conversions. Limitations such as the inability to include links in Instagram posts, for instance, make it even harder to measure these metrics. The traditional approach of using UTM parameters or link shorteners such as bit.ly get closer to measurement but actually often under report ROI and are not sufficient when looking at effectiveness of different influencers. Along with measuring your results, there is also the challenge of audience targeting. Influencers can create high-quality content that is bound to engage their followers. But the reality is that social media algorithms determine which followers will see the content. There is no way to guarantee that the “premium” audience of the influencers will see the content. This premium audience is the group of followers who are the influencer’s most loyal fans and are more than willing to follow any recommendations given by the influencer. Social media platforms focus on driving “engagement” on posts with their algorithm when you most likely would choose to optimize for “conversion”. 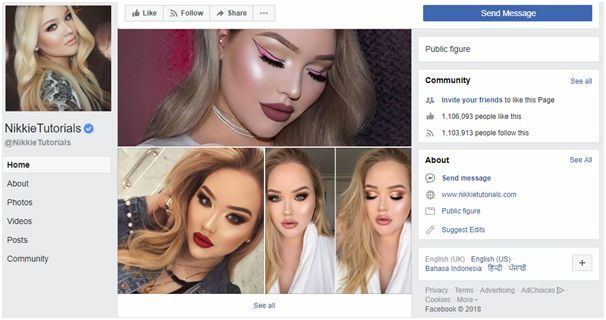 Let’s take a look at the Facebook page of Nikkie Tutorials, for instance. There are more than a million likes on the page, as you can see in the screenshot below. But are her posts reaching the desired audience? If we take a look at one of her most recent posts, we can see that it has just over a thousand reactions. There are only 33 comments and 15 shares. These numbers are shocking considering the number of people who are supposed to be following this page. This clearly shows that even influencers are struggling to get sufficient organic reach. So you can imagine how challenging it is for marketers to ensure that the influencer content reaches the desired audience on social media. Marketers may also face some challenges in scaling the content from their campaigns. If they want to ensure that the campaign reaches a significant audience, they will need to produce more content. And to produce more content, they will need to recruit more influencers for their campaign. What if there were a way to apply the concepts of programmatic media to your campaigns so you could overcome these challenges? The idea behind this is to amplify the content created by influencers, target a highly relevant audience, and measure the results generated by the content. The good news is that Facebook has introduced their Branded Content feature to provide marketers with the solution to amplify their branded influencer content. Using this feature, brands can amplify the content created by influencers to make sure it reaches a larger audience. Your influencer will have to tag you in the posts they’ve created for you. After this, the feature gives you an option to boost the posts in which your page has been tagged. You just have to pick which ones you’d like to boost. Additionally, the feature gives you detailed insights into how the influencer-created content is performing in terms of reach and engagement. It also helps you keep track of the CPM and spend of your ads. So you can see that the Facebook Branded Content feature is solving some of the major influencer challenges. It helps tackle the issue of poor organic reach by giving an option to amplify influencer-created content. It also ensures easier tracking of content performance using a number of important metrics. However, there are a couple major limitations of this feature. Brands can only amplify the influencer-created content to reach their existing audience. They cannot target the audience they don’t have access to. In other words, they will be unable to amplify the content to the influencer’s audience (or lookalike audiences). These premium audiences often deliver the best results from a CPM, CPC, and CPA perspective. Brands cannot add a call to action to the post to improve performance from a ROI perspective. The CTA I am referring to are those “Learn More” and “Shop Now” buttons you will see scrolling through your Facebook and Instagram feeds. Platforms like Instagram have become much more accommodating of influencer marketing requirements. They have introduced their own Branded Content feature in which influencers can tag the brand prominently in the sponsored content they create for them. This helps maintain transparency and ensures an adherence to the FTC guidelines. Check out how the Paid Partnership tag on Instagram looks in the following sponsored content created by Eugene from Buzzfeed for House 99. The problem, however, is that there is no way for your brand to amplify this content created by the influencer. Some brands may resort to paying their influencers to boost their sponsored posts. Others have started to request advertising privileges to influencer accounts, with mixed success of getting actual access. This is a process known as whitelisting and has become a trend. Whitelisting gives brands the freedom to modify images and create more compelling copy. They even run ads through the influencer’s account and add CTA’s like “Shop Now,” “Download Now,” or “Learn More” buttons. 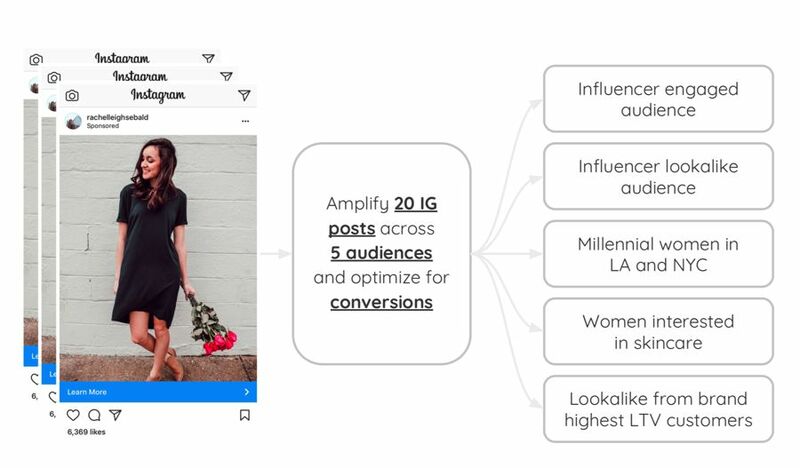 In other words, they can optimize the influencer’s content to drive more conversions and get full funnel analytics. The biggest challenges with this solution are that it is difficult to scale, difficult to get your influencers to agree to give this level of access to their account, and difficult to measure conversion. You will typically need to have firm rules in place contractually and go through every detail of the agreement before you can apply this solution. The branded content tool and whitelisting deliver value but have unique setbacks. While branded content tool offers effective ROI measurement,it lacks in the ability to effectively reach an influencer’s audience. Whitelisting is hard to scale and measure conversion along with presenting some challenges in terms of agreements with the influencers. So what exactly can you do? How do you ensure that you amplify your content to reach a new and highly valuable audience? How do effectively boost influencer content without forcing them to sacrifice control of their handle? And finally, how do you effectively measure the ROI of your efforts, including conversion all at once? The best possible solution is use influencer content amplification marketing software that has been created for this purpose. Lumanu, for instance, focuses exclusively on bringing programmatic media buying behind your influencer marketing program. It enables you to run optimized amplification through influencer accounts and ensure that you reach a highly engaged audience. Through this platform, influencers can securely share audience data and permissions with their brand partner. Brands can leverage the platform to deliver influencer content as paid ads that is optimized across audiences. Including the influencer audiences, lookalike audiences, brand audiences, and Facebook interest targeting. The platform is powered by SocialCert, which your influencers connect to in order to become a part of your SocialCert network. Once influencers are in your SocialCert Network, you can amplify the content they create for your brand and optimize for your objectives. This visual diagram helps illustrate how programmatic amplification works in practice. Programmatic allows your to coordinate amplification of your influencer content across audiences to deliver the best result (if it sounds a lot like Facebook ads, that’s essentially the approach the platform is taking). 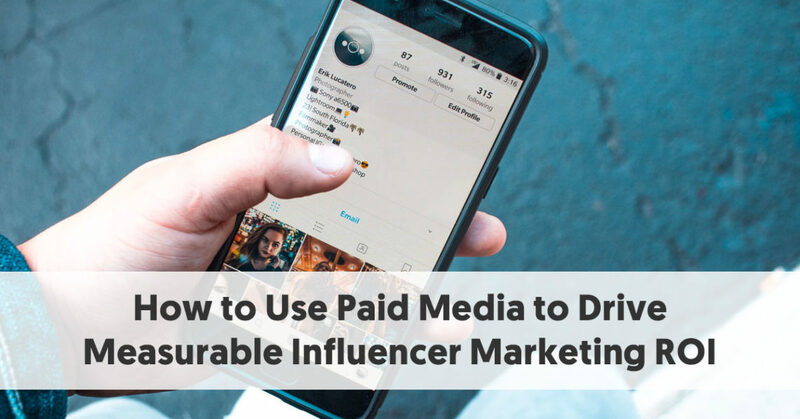 These are some of the best ways to use paid media so you can drive measurable results in your influencer marketing campaigns. The drop in organic reach due to changes in social media algorithms along with the difficulty in scaling influencer campaigns has brought on some challenges in influencer marketing. These solutions can help you overcome these challenges.